Content Notes: Kickstarter Edition set of five Graphic Novel Adventures. Includes: Captive, Tears of a Goddess, Loup Garou, Your Town, Sherlock Holmes: 4 Investigations and a Kickstarter Exclusive Custom Slip Case to hold all five books. Please note: unless otherwise stated paid add ons from the Kickstarter Campaign are not included. Captive - Why would someone attack a policeman? It's one of many questions you've been obsessing about since you received this ransom demand following your daughter's kidnapping. 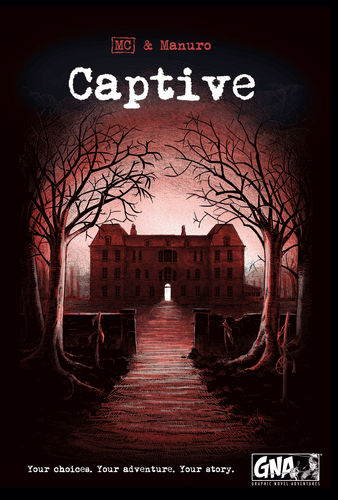 As you begin walking toward the front door of a manor house deep in the woods in Captive, your hand cramping above your weapon, your spirit satiated with fear, you anticipate that things will turn out badly. Your intuition will not betray you — even if you were far from imagining what was actually in reserve for you on the most horrifying evening of your entire existence. Captive is a comic combined with a game, one title in a series subtitled "The comic in which you are the hero". You embody a character in a immersive story in which your choices guide your progress. You have a character sheet akin to those used in role-playing games that tracks your possessions, your special abilities, your coins, and your victory points. In general, gameplay consists in following the comic's panels — which contain clues, riddles and traps — and making choices about where to go and what to do, while using your visual perception to collect clues and be smart enough to resolve the riddles. As in any game, you can lose — sometimes really badly! Your master, the mage Theodocred, charges you with finding a three-horned slug. Arming yourself with courage, you go into the night, but as soon as you enter the forest a creature comes up and claws you. Now a werewolf, will you survive your first transformation, werewolf hunters, and other unforeseen dangers? Choose your specialty, thief, wizard or barbarian, choose the right paths, and find an effective weapon! The choices are yours in this game book! 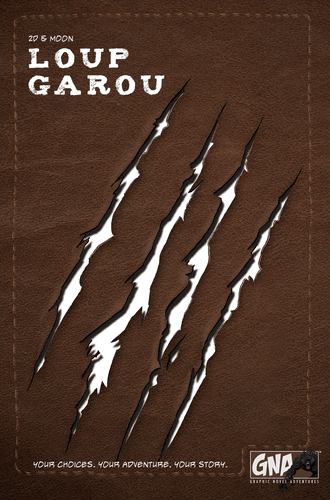 Loup Garou - Loup Garou is a comic combined with a game, one title in a series subtitled "The comic in which you are the hero". You embody a character in a immersive story in which your choices guide your progress. You have a character sheet akin to those used in role-playing games that tracks your possessions, your your coins, and your victory points. In general, gameplay consists in following the comic's panels — which contain clues, riddles and traps — and making choices about where to go and what to do, while using your visual perception to collect clues and be smart enough to resolve the riddles. As in any game, you can lose — sometimes really badly! 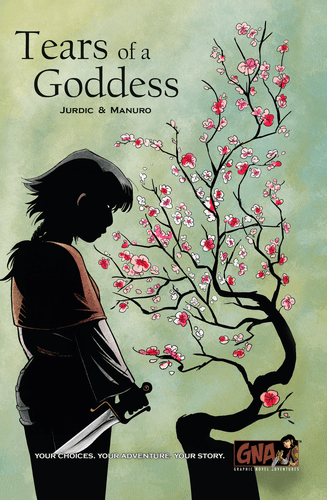 Tears of a Goddess - Three experienced criminals stole relics of divine essence at the Nüwa Temple. This theft, simply committed by greed, threatens to plunge the city into an era of plagues and cataclysms. Of course, you are not irreproachable on this ground .. As a bounty hunter, each contract is valid if it is lucrative. Also, do you agree to hunt down these looters! Immerse yourself in a medieval Asian universe and play the heroine to find the three criminals. Tears of a Goddess, a.k.a. Nuwa's Tears, is a comic combined with a game, one title in a series subtitled "The comic in which you are the hero". You embody a character in a immersive story in which your choices guide your progress. You have a character sheet akin to those used in role-playing games that tracks your possessions, your special abilities, your coins, and your victory points. In general, gameplay consists in following the comic's panels — which contain clues, riddles and traps — and making choices about where to go and what to do, while using your visual perception to collect clues and be smart enough to resolve the riddles. As in any game, you can lose — sometimes really badly! Sherlock Holmes: Four Investigations - Flights, disappearances, murders ... Business accumulates on the desk of the famous detective. Step into the shoes of Sherlock Holmes or Dr. Watson, and solve four particularly delicate investigations. Tracks to follow, suspects to question, hints to take up, make the right choices because the hero is you! 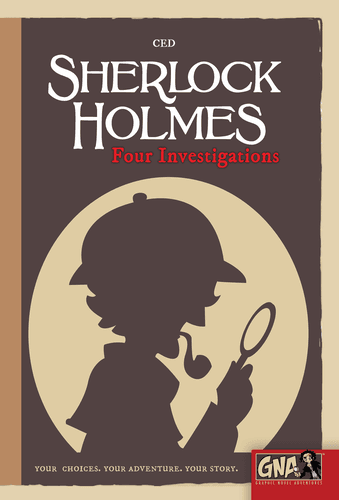 Sherlock Holmes: Four Investigations is a comic combined with a game, one title in a series subtitled "The comic in which you are the hero". You embody a character in a immersive story in which your choices guide your progress. You have a character sheet akin to those used in role-playing games that tracks your possessions, your special abilities, your coins, and your victory points. In general, gameplay consists in following the comic's panels — which contain clues, riddles and traps — and making choices about where to go and what to do, while using your visual perception to collect clues and be smart enough to resolve the riddles. As in any game, you can lose — sometimes really badly! 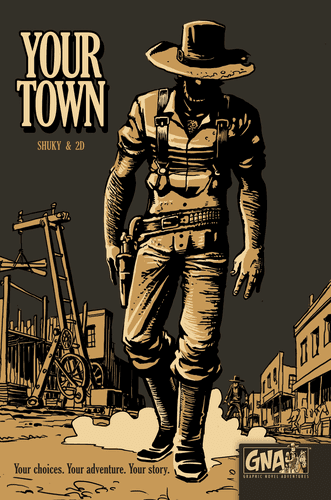 Your Town - Lost in the middle of the vast American wild west, you arrive in the small town of Your Town. After going around, your decision is made: you will improve it and make it prosper. Build buildings, hire qualified staff, buy land, manage your finances, because the mayor of this city is you! Your Town is a comic combined with a game, one title in a series subtitled "The comic in which you are the hero". You embody a character in a immersive story in which your choices guide your progress. You have a character sheet akin to those used in role-playing games that tracks your possessions, your special abilities, your coins, and your victory points. In general, gameplay consists in following the comic's panels — which contain clues, riddles and traps — and making choices about where to go and what to do, while using your visual perception to collect clues and be smart enough to resolve the riddles. As in any game, you can lose — sometimes really badly! We're glad to back campaigns to bring you games like Graphic Novel Adventures Kickstarter Game to buy online at TheGameSteward. We will use a hefty percentage of every dollar you spend on Graphic Novel Adventures towards backing fantastic new games on Kickstarter! Just a reminder, if you have purchase questions on Graphic Novel Adventures (Kickstarter Special Edition) game, how to buy online at The Game Steward or just need a game advice, please contact us at The Game Steward.